PSConfig gives you command-line access to the configuration data of your Pervasive engine, allowing you to save and later restore the configuration data -- but that is just scratching the surface! 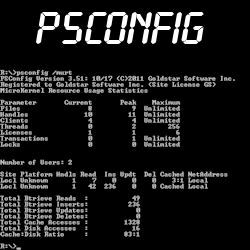 PSConfig also provides access to the Monitor data from that same command line -- giving you the functionality of a super-powerful monitoring and user management utility at your fingertips! Even better, PSConfig has a special "web interface" mode. Add PSConfig to your web server as a CGI application, and you can access the Pervasive configuration and Monitor data from any web browser, anywhere in the world, even from your smartphone!